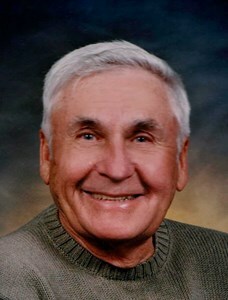 Terrance (Terry) Wohlfeil, 90 Born July 25, 1928 in Green Bay, WI went to be with the Lord on Jan. 31, 2019. Terry graduated from Green Bay West High School in 1947 where he was very proud to hold the school record for the 100 yd dash in 10.01. Terry was preceded in death by his parents, Clerance and Evelyn Fritche Wohlfeil and his sister Shirley Ridgley. Terry is survived by his wife, Lois of 42 years. They reside in Wautoma, WI and have wintered the last twenty years in Clermont, FL. Terry loved to golf. On July 4, 2007 he got a whole-in-one at Two Oaks golf course in Wautoma. The last few years his favorite pastime was Bingo. He loved to go to Bingo. He called himself the Bingo Nut. Terry is survived by one son Steve (Melody) Wohlfeil and two daughters, Kim (Mike) Delfosse and Barbara (Paul) Vandersteen, all of Green Bay, WI. Three Step-children. Ellsworth (Sue) Townsend, Lakeland, FL., Debrah (Dean) Netzer Neshkoro, WI and Gerald (Conni) Townsend, Wausaukee, WI. Terry loved spending time with his grandchildren, going motor home camping, vacationing and cruises and they loved being with him. All twenty of them. Tiffany (Nick) Amlot, IL. Natalie (Jason) Higbie, Madison Wi, Amy (Andy) Vahamas, Green Bay, WI, Heather (Ryan) Smurawa, Green Bay, WI., Michael Terrance Delfosse, Green Bay, WI., Jason (Michelle) Wilhelm, WA, Molly Forslund, Green Bay and Tanya Forslund also of Green Bay, WI, Renetta (Matt) Detaege, Little Suamico, WI, Rita (Billy) Comins, Lena, WI and Buddy (Kari) Ward, Oconto Falls, WI, Tiffanielyn Netzer, Lena, WI., Nichole Townsend, AZ, Ellsworth S. Townsend, CA, Gerald Townsend Jr. Niagara, WI, Eric (Krystle) Townsend, MT, Russell (Andrea) Townsend MT, Alex Townsend, MT, Lydia Townsend Wausaukee, WI and Danielle Townsend, Wausaukee, WI. Terry also has 28 great-grandchildren. In lieu of flowers contributions to Tunnel 2 Towers to help families of fallen soldiers and fallen first responders. Add your memories to the guest book of Terry Wohlfeil. It has been my pleasure to be Terry's "Florida" pastor for the past five years. I always looked forward to seeing him and Lois in the Fall as the temperatures fell in the North. He had such a positive look and brightened my day. I knew that I would receive an encouraging word from him (pastors spend so much time giving encouragement it is nice to receive it). The few times we did something with Terry & Lois, Terry was always so much fun. He always looked at the bright side of everything and seemed to enjoy life. (We will always remember his rendition of Elvis.). Heaven will enjoy your wit. Terry always had a big smile and a big heart. He loved bingo and his smile got even bigger when he won. He would help anyone and together with Lois I couldn't ask for nicer friends . We will miss you Terry .. God bless always.